UltraFlex headgear design includes eye/scene cameras, audio, and infrared illumination. Our standard products help you get your project up and running quickly and affordably. We have off-the-shelf solutions in adult, child and infant sizes. These options can be configured to meet the needs of both laboratory and field work. 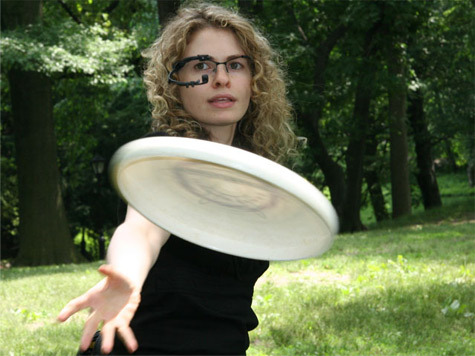 Our UltraFlex headgear design is a modular, dark-pupil, infrared eye-tracking headgear. Minimal adjustments are needed to get the best eye and scene images for tracking a range of observers. No mirrors are required. The infrared LED and eye camera are mounted on a flexible arm for easy positioning from subject to subject. All headgear are compatible with our low cost 20-foot tethered laboratory kit. Additionally, the headgear interfaces with our Mobile Eye-Tracking Laboratory (METL), which is a custom 11” MacBook Air backpack harness. The heart our capture solutions use PSLiveCapture software to record synchronized eye, scene, and audio video data for post gaze processing in our eye-tracking software. 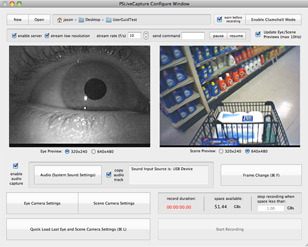 PSLiveCapture allows you to stream eye/scene video wirelessly from our METL to our eye-tracking software for near realtime previewing and test calibration. 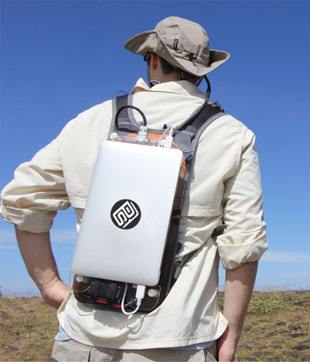 When used with our mobile kit, PSLiveCapture software supports 90-degree screen rotation for previewing the capture stream on the laptop while the participant is wearing the backpack. Computer battery level and hard drive space are also monitored to issue a "stop record" command during long record sessions. Designed for wearable and laboratory settings, PSLiveCapture software captures synchronized eye, scene and audio for post-gaze analysis. Our 20ft Tethered Laboratory Unit (TLU) is perfect for experiments in the lab. 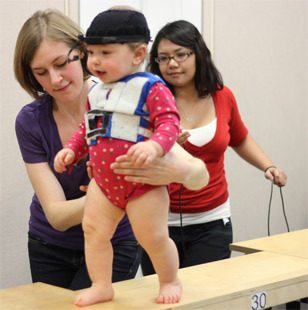 Headgear is available for infants, children, and adults (image courtesy of NYU Infant Action Lab). Need in the field solutions? Try our Mobile Eye-Tracking Laboratory (METL) with 11” MacBookAir harness and UltraFlex headgear. We understand our standard equipment won’t meet the needs of every single project. Our in-house design capabilities allow us to create custom hardware based on your specific needs. If you’re looking for the ultimate eye-tracking solution for your project—at a price that will accommodate most budgets—Positive Science will deliver.